Turntables allow high speed indexing production for operations that cannot utilize material directly from the roll. Most commonly used with products that require pre-cut material. Also, used extensively in the sealing of clamshell packages and tube mandrel sealing on medical & inflatable bladders. Top Diameters: Standard 72", 84" & 96"
Available with PLC control for system integration with Hot Stamp Presses, Silk Screeners, etc. 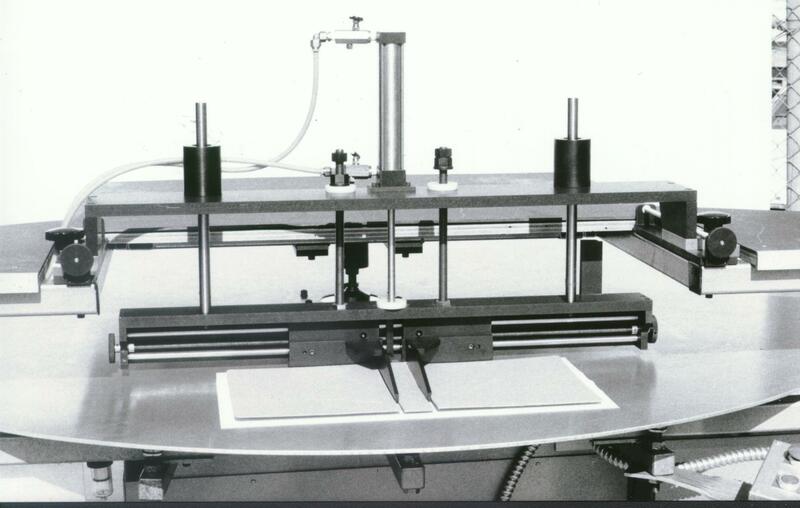 Used extensively in the Bindery Industry for making RF Heatsealed Notebook Binders and Slipcase Covers, Board Positioners can also be used in the fabrication of turned edge glue binders. Board Positioners allow an operator to easily grab the process materials and accurately locate them for indexing to the next operation. The Board Positioners are standardly designed for 72", 84" & 96" diameter turntables but can also be used on any surface area. The alignment fingers are adjustable for making 1/2" up to 5" spine ring binders. With specially designed alignment fingers, two or more binders can be made per station. Pick & Place Feeders can accurately pickup and remove material from either a Rotary or Inline Assembly System. The Pick & Place Feeders are made-to-order and can handle all the materials used in the fabrication of a standard looseleaf binder. In addition, thermoformed articles can also be easily picked and placed. Pick & Place Feeders utilize a programmable controller and integrate with Turntables, Inline Board Feeders, RF Heatsealing Presses, Glue Applicators, Hot Foil Stamps and other automated pieces of equipment. Automatic Loading Trays are used solely in the bindery industry. Loading Trays provide a positive and secure positioning of cover & backing material with quick, accurate indexing that relieves the operator from positioning under a Press. All of our Loading Trays are capable of handling concealed spine rivet binders. With the addition of a pillow block adaptation, thermoformed audio/video cassette binders are easily handled.